When it comes to Chinese cooking, we spend quite a lot of time in preparation (to cut, dice, mince, julienne, chop, etc.). 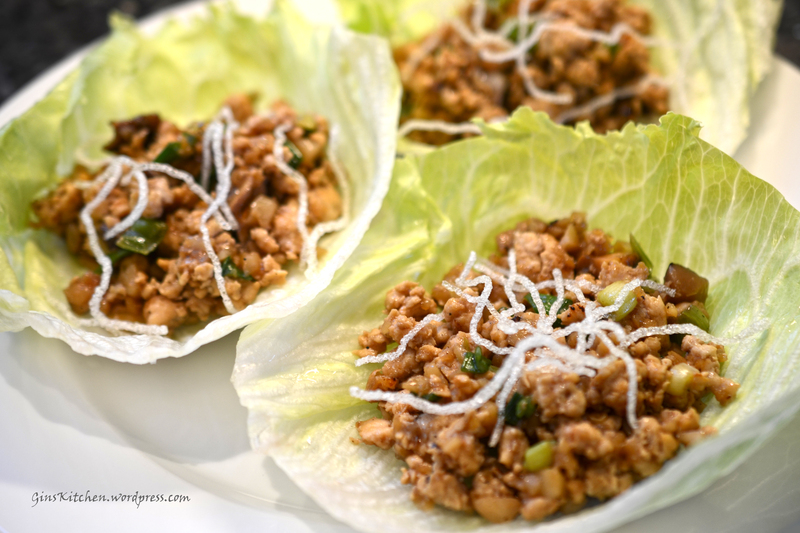 As a working mom, lettuce wraps is only a weekend dish as I don’t have enough time to cook it after work. People may find this recipe complicated but it’s worth your time and once you get a handle on it, it is pretty easy. There are a lot of 30 minute meal recipes, but sometimes we just need to slow down and enjoy cooking and eating. To deep fry the vermicelli, pour 1 cup of oil into a saucepan over medium low heat. Make sure the oil is hot enough by dropping one noodle into the oil. If the noodle immediately puffs and turns white, the oil is ready. Fry the noodles in batches, make sure you won’t crowd the pan. Remove the noodles as they puff, and drain them on paper towels. Cover mushrooms with boiling water, let stand 30 minutes then drain. Discard woody stems and dice mushrooms, set aside. Mix all ingredients for cooking sauce in a bowl and set aside. In a medium bowl, marinate chicken with cooking wine, soy sauce, salt, pepper and cornstarch. Let it sit for 15 minutes. Add 3 Tbsp oil to a saucepan/wok over high heat, stir fry chicken until cooked. Set aside. Add 2 Tbsp oil to a clean saucepan/wok, add ginger, garlic and chilies. When garlic is slightly brown, stir in water chestnuts and mushrooms (about 2 minutes). Return chicken to pan, add 1/3 of the cooking sauce and keep stirring. The chicken should have a nice coat of sauce, if you see any white part (without a coat of sauce), add more sauce in. Turn off the fire and sprinkle green onions on top. Spoon chicken mixture into lettuce leaf and top with cooked vermicelli. The remaining sauce can be saved and served on the side with the lettuce wraps. I normally like to bring the sauce to a boil or you can just serve it without cooking. Note: To save time, you can buy ground chicken at the market. I like to rinse the meat before cooking and ground it myself with a food processor.